This is a beautiful Art Deco Jewellery box dating to the 1920s. 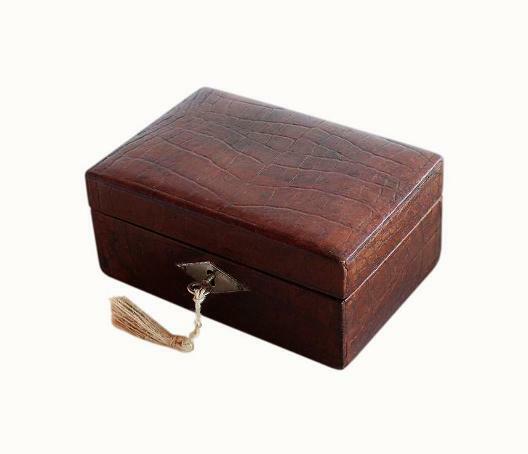 This box has a deep brown crocodile skin finish and a stylish diamond shaped escutcheon to the lock. This is a base white metal. 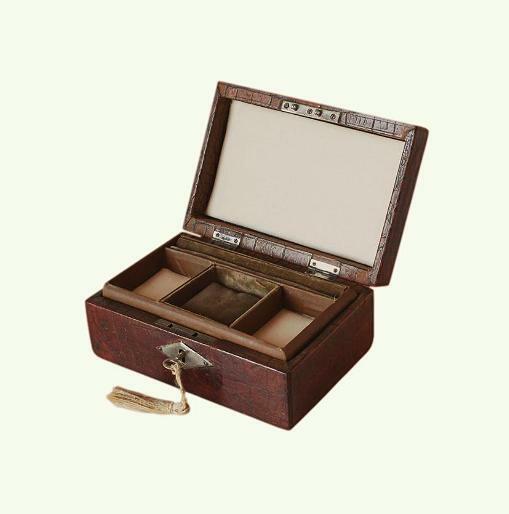 The box is complete with its original 'stop' hinges and original British Made lock and key. These too are made of base white metal and they compliment the escutcheon. The hinges prevent the lid from falling back. The bottom of the box has its original vinyl covering. The interior has a lift out storage tray with three compartments and a ring storage section. Beneath this is a further larger compartment. 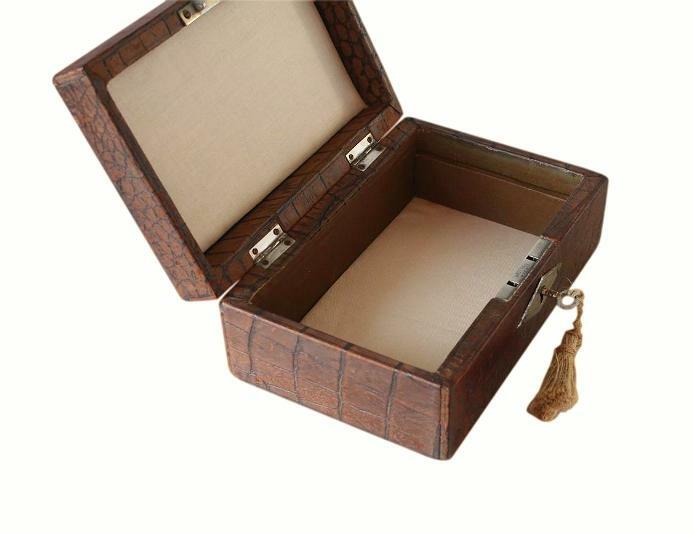 The left and right compartments in the storage tray, plus the lower compartment and inside of the lid, all have their original padded beige silk panels. The centre compartment has its original padded velvet panel and linings, and the ring storage section also has its original padded velvet covering. The exterior and inner walls of the storage tray have their original silk coverings, and the interior walls of the lower compartment have their original paper linings. 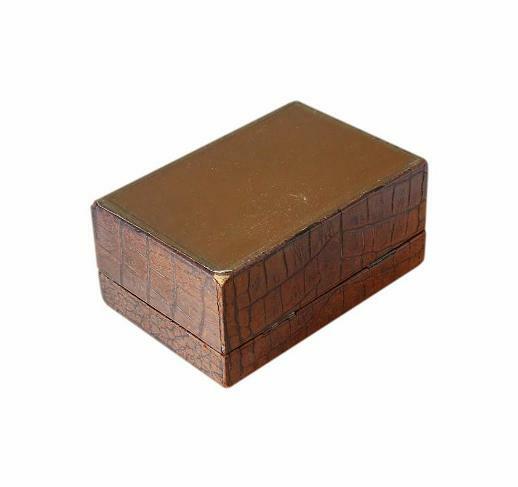 This lovely box is in good condition for its 90 plus years of age. There is some minor wear to the crocodile skin, mainly to the bottom corners of the box, and there is some friction wear to the vinyl covering on the bottom of the box. We would like to make you aware that vintage locks can suddenly malfunction at any time. They are already very old and will naturally have some wear from age and use. We are not responsible for locks that malfunction from further age and use, once a box is purchased. 6.3 by 4.5cm with a 1.9cm depth. 6.1 by 5.3cm with a 1.5cm depth. Space for approximately 7 rings. 15.5 by 9.8cm with a 3.0cm depth. (4.5cm depth if the tray is not in situ). International postage is £25 by Royal Mail International Tracked & Signed For. Delivery is fast, within 3-5 working days to Europe and 5-7 working days to the rest of the world.